Haven’t Thought (or Shot) a Video? Maybe You Should! Youtube is hot: thousands of videos are uploaded and millions are viewed every day on the video channel. Do you think Youtube is only for bored junior high school kids? It’s not! Many small businesses are creating videos and uploading them to Youtube. Why? I think it is a combination of the popularity of Youtube and the ease of using Flip Cams and other small, point-and-shoot cameras. Today, videos don’t even need editing or fancy soundtracks to become popular. 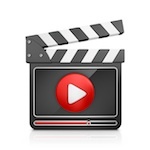 Video Marketing: Over the Top? I’m a big fan of using youtube and videos to grab attention, entertain your target market, generate leads and market products and services. And I’m always looking for entertaining small business marketing videos. Is Your Marketing All Wet? Quick before the summer ends, unkink the hose, get leads flowing into your pipeline and power up your marketing. And let me know your thoughts on this video. Or if you think you have a great idea for a funny video ad about small business marketing I can use, add a comment and let me know how to contact you.